I believe everyone should practice reading back, so that you can be good at reading back. Once you are good at reading back, you can do far less of it. But always do some so that you will not lose the ability to read back at a good pace. Personally, I don't find reading back to be something that helps me in speed building. To me it's a waste of time. Because court reporters must be able to read back, we must practice so that we are able to read back. But not for gaining writing speed. Here is a description of my speed building method, which does not include practicing for control, and I will explain why further down. When you practice 25-30% above your Top Speed, your Top Speed goes up, automatically. And your Realtime Speed automatically goes up as well. By itself. It rises at the same rate the Top Speed rises, all by practicing at high speeds. You can prove speed building works by testing yourself at, say, 10% above your old Top Speed, and 10% above your old Realtime Speed, and you will see that you are now better. So, no need to practice for "control," as you have already improved merely by high-speed practice. Harold is a student who has passed two Q&A tests at 200wpm. Let us call that his Top Speed. Or at least, he is almost at 200, since he has only passed two tests at that speed and failed a number of others. When Harold writes Q&A at 160wpm (or so), it's nearly perfect. So that's his Realtime Speed. Now, at this point, if Harold wants to write for "control," he can just go to 160wpm, and he has great control there. If he goes to 200wpm, he's barely hanging on, not much control there, but he has passed two tests. It's not beautiful by any means, but he can pass 200wpm on occasion. To the contrary, I teach that Harold should now be practicing at 25-30% faster than his Top Speed, which means, he should practice Q&A at 250-260wpm. After practicing this way for as long as he can, as often as he can, Harold then should come back down to 200wpm to TEST himself. He should write at 200wpm for ONLY 30 SECONDS, still following #1, #2, #3, and #4 above. He should be able to read it back (or transcribe it) PERFECTLY. Harold does so, and he's amazed that he can write a 200wpm, for 30 seconds, perfectly! Using this method, he will master 200. Next comes 225. Now he should practice 280-290wpm, using the same methods. WARNING: If you are a student or reporter using a STROKE-INTENSIVE THEORY, you MUST also shorten your writing by incorporating hundreds, and then thousands, of briefs for common words and phrases. If you don't, your Top Speed, even using my methods, will be LIMITED to (depending on your talent level) 225-240, and 260 for the most talented. 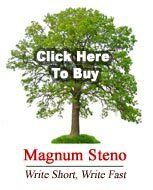 ï¿½2019 Magnum Steno and Fencl Web Design. All Rights Reserved.